You have probably already crossed their path on Instagram, on television or even at a concert. They, the virtual influencers. Yesterday confined to the social network of the image, they are now present everywhere. Olivier Rousteing, himself, solicited 3 CGI (Computer-Generated Imagery) models to showcase Balmain’s collections. Margot, Shudu and Zhi are nothing more than virtual and yet they are stars. The influencer is an individual who, thanks to his charisma, his values, his empathy can influence consumer behaviour. Now imagine that this power of influence is delegated to computer-generated images generated directly from Silicon Valley. Incredible, isn’t it? 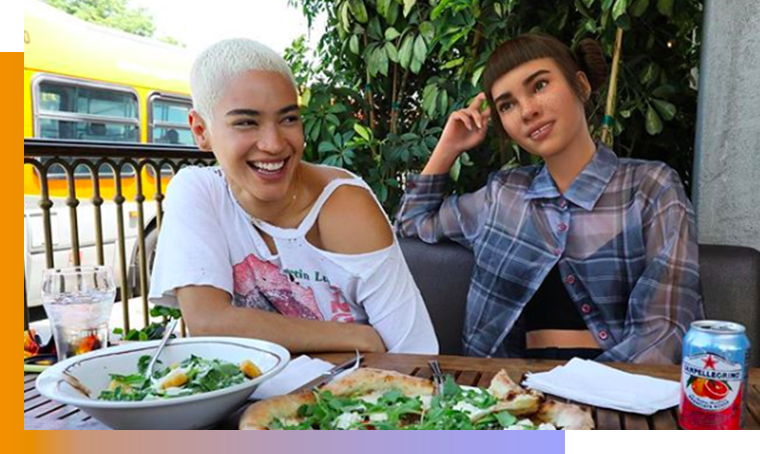 Yet you couldn’t miss the Lil Miquena or Bermudaisbae phenomenon, virtual influencers whose communities are growing at high speed. The subject has not yet been addressed by Black Miror’s screenwriters themselves, and yet it raises many questions about our permeability to fake on the internet. It’s no secret that we live in a digital world! Machines have gradually replaced some trades in order to improve productivity and profitability. And today, they are invited to activities where personality is at the heart of the profession. After revealing themselves on social networks, these holograms invade unsuspected places. Singer, artist, personality, no one will escape it! In today’s imagination, buying a concert ticket is an experience that, beyond listening to music, allows us to admire the talent of a personality that fascinates us, a hero of modern times. Only tomorrow this fascination may be born of artificial personalities. It seems confusing, and yet…. On December 1st, thousands of people came to attend the Hatsu Miku concert! To sing and dance to the rhythm of this virtual creature born on Youtube in 2007, and projected off the web after appearing in television commercials for industry giants like Toyota or Sony. But it was after having performed the first part of a Lady Gaga show in 2014 that the phenomenon spread beyond the borders. 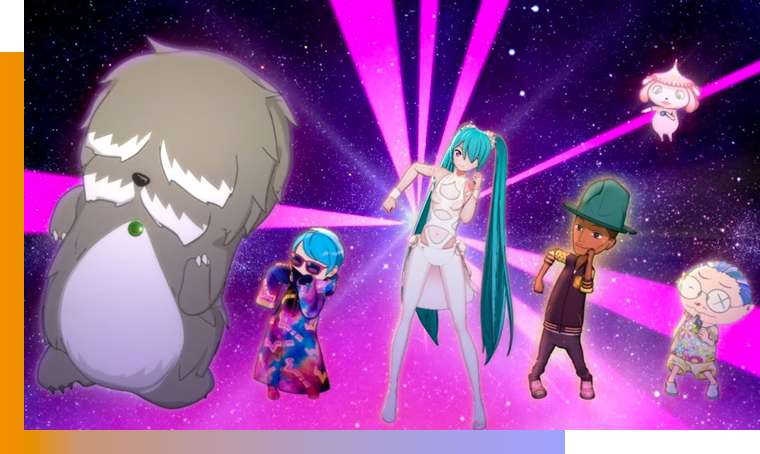 Pharrel Williams was also won over by the virtual singer, and remixed Hatsune Miku’s cult title: Last Night, Good Night. The popularity of this humanoid does not embody the apocalyptic vision of virtual robots or singers replacing humans, as one might think. This character with infinite personalities develops everyone’s creativity in a collective spirit. Indeed, everyone can use their voice and appearance in their own content. She is the representative of a new form of culture 2.0 in which everyone can participate. The virtual fascinates, the virtual sells! Paradoxically, the use of Liv actually contributes to the trend of digital detox. Indeed, by using an entity made of pixels that finally feel emotions, Renault invites us to leave a virtual world too often invested by man to the point of dehumanizing him, in order to find real sensations at the wheel of the new Kadjar. We told you about it at the beginning of the article: Olivier Rousteing, artistic director of Balmain, has also taken hold of the phenomenon to present his new collection. 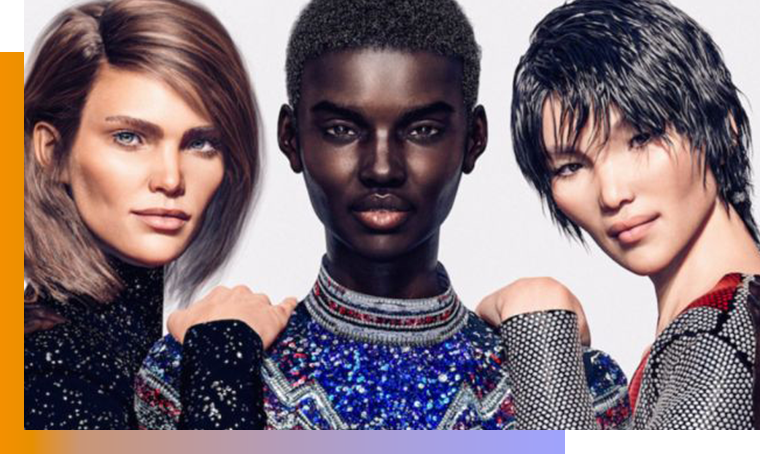 The result: three new virtual muses for the famous Balmain Army, once trusted by the Kardashian or Rihanna. This unexpected recruitment is undoubtedly a double-edged sword. On the one hand, the young creator remains at the forefront of the trend and listens to the weak signals that govern the media star (Instagram) among young people, but on the other hand, he exposes himself to critics who question the legitimacy of these muses 2.0. Indeed, it is necessary to highlight the paradox of this new generation trend. In recent years, we have witnessed the questioning of injunctions made to women and especially the diktat of the perfect body. So, is it good taste to use muses with more perfect measurements than the most perfect human model? Some doubt it and denounce it. However, the assumed “fake” of these personalities will appear for others to be uncomplicated. There is no confusion here, the lie is accepted. Although these influencers singularize our behaviors, they will never possess the ability to think, free will, or emotions. In the end, they only exist through the eyes of those who contemplate them.